Photographer(s) Appreciation: Thank you to marianne aka marcella2/tovje@Flickr for sharing another one of her photographs with us, Nymphoides peltata. Appreciated as always! Nymphoides peltata, or yellow floating heart, makes a second appearance on Botany Photo of the Day, this time with a close-up of a flower. Tamara Bonnemaison wrote an excellent entry on this species in 2015: Nymphoides peltata. Menyanthaceae is a family of only 5 genera and approximately 60 species, two-thirds of which are in the genus Nymphoides. 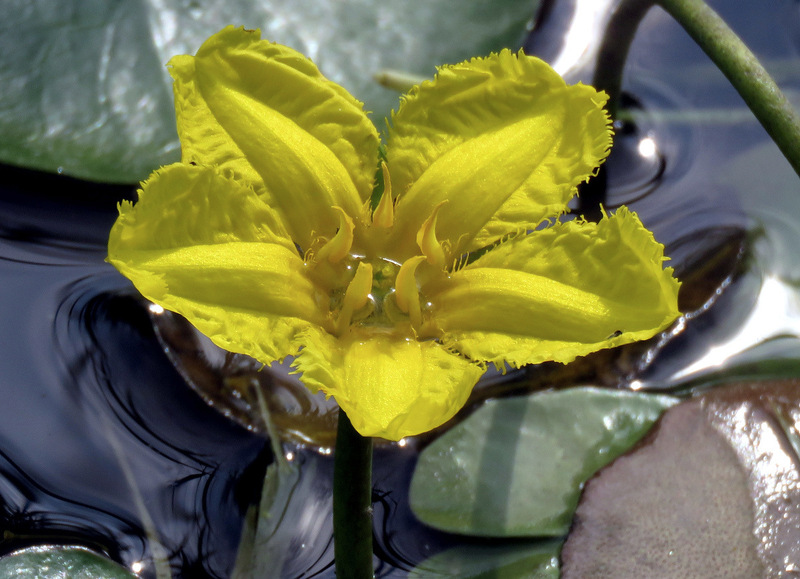 This family of wetland and aquatic plants has a worldwide distribution, excepting some of the most inhospitable parts of the world: the Sahara, western and central Australia, Greenland, and Antarctica. Nymphoides spans both hemispheres; Menyanthes and Nephrophyllidium are strictly Northern Hemisphere; and Liparophyllum and Villarsia are found in the Southern Hemisphere. Pretty yes but also invasive. This has been sold in Northern BC as a non-hardy pond plant. Unfortunately it does fine in larger water bodies and has infested Seymour lake near Smithers BC. Treatment is difficult. There should be invasive warnings with any botany photo of the day for any species that known to naturalize or especially for those that have already been deemed invasive. Two comments. FIrst, the invasiveness was written into the 2015 entry by Tamara. I tried not to repeat her information, though I learned after publishing the entry that I repeated info from an earlier entry on a Nymphoides relative. Secondly, invasive to where? That seems like an almost-impossible task with a global audience and sometimes the lack of information about a species we feature. I think we’re pretty good about mentioning it when we do encounter that info, but that’s not a constraint I feel must be researched for every entry (besides, it gives people something to comment about when we do miss it 🙂 ).